This week, the annual conference of the Australasian Systematic Botany Society (ASBS) is held in Brisbane. The theme of the conference is Mind the Gap and aims to highlight gaps in the field of systematics (be they biogeographic, taxonomic, data, funding, etc.). 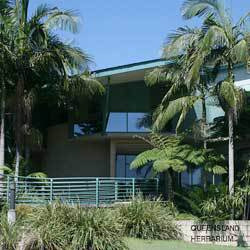 It is organised by the Queensland Herbarium and held at the Brisbane Botanic Gardens Mt Coot-tha, Toowong. About 110 delegates from Australia, New Zealand and overseas are meeting to hear 55 presentations. From the State Herbarium of South Australia, Bill Barker and Francis Nge are giving talks on the genus Lindernia and the diversification of Australia’s temperate flora, respectively. The Proceedings of the Conference with abstracts of all presentations are available for download [1.73mb PDF] from the website. Before the Conference, a workshop was held on on how to referee taxonomic manuscripts. A field trip to Springbrook and to the precipice of the remains of the Mt Warning caldera is organised for Friday. Information on previous meetings can be found on the ASBS website. The last Conference was held in Adelaide and the 2016 meeting took place in Alice Springs. Proceedings of both meetings were published as Swainsona Supplements and can be downloaded from our journal website. This entry was posted in News on 6 December, 2018 by Jürgen. 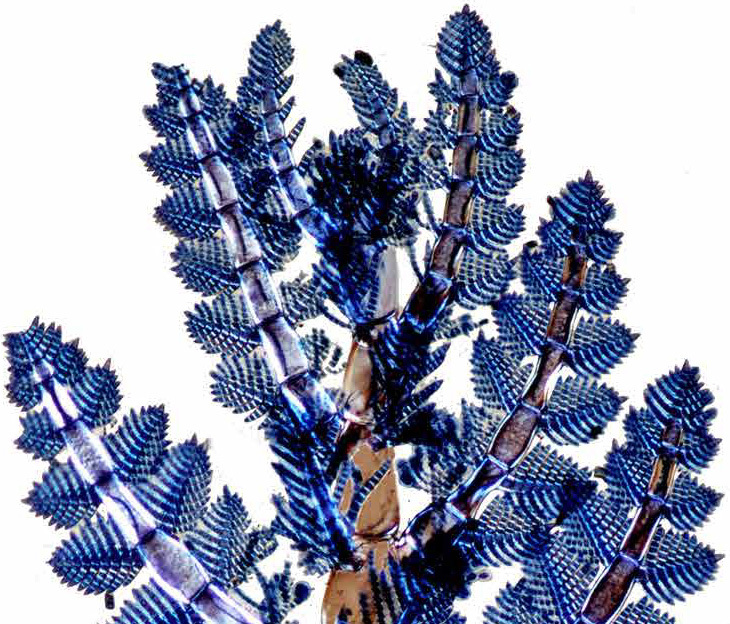 Stenanthemum leucophractum, photograph of herbarium collection JK743. Photo: J. Kellermann. State Herbarium of South Australia botanist Jürgen Kellermann and PhD-student Francis Nge recently spent a week on Eyre Peninsula to collect plants, in particular Rhamnaceae (Cryptandra, Pomaderris, Spyridium, Stenanthemum ¹) and Myrtaceae (Calytrix ¹). Cryptandra sp. Hiltaba, collected north of Cowell. Photo: J. Kellermann. 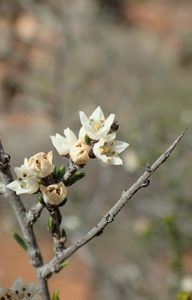 The State Herbarium is host-institution of a project revising the plant family Rhamnaceae for the Flora of Australia, with Dr Kellermann as the lead investigator. Rhamnaceae is one of the 20 largest plant families in Australia and a well-known component of Australia’s temperate and semi-arid flora: 25 genera and over 250 species occur in Australia (see ABRS 2016 Conference abstract; 1 mb PDF). However, the only Australia-wide treatment available to date is by George Bentham (Flora Australiensis, 1863). Together with interstate colleagues, the family will be examined using molecular and morphological methods. The 3-year project is funded by the Australian Biological Resources Study. Francis Nge is using Rhamnaceae and Calytrix as case-studies for his PhD thesis on the evolutionary history of the Australian temperate flora. He is based at The University of Adelaide and the State Herbarium. Calytrix tetragona at Warrow Road. Photo: F. Nge. Francis & Jürgen traveled mainly in middle and northern Eyre Peninsula, especially the area around Kimba, Pinkawillinie Conservation Park, Cleve, Cowell and Hincks Conservation Park, with a short trip to Wanilla Settlement Reserve. During the field-trip, they collected 168 specimens, many with duplicates, as well as leaves in silica gel for DNA analyses and flowers preserved in 70% ethanol. Almost all collections were documented with close-up photos, habit and habitat shots. 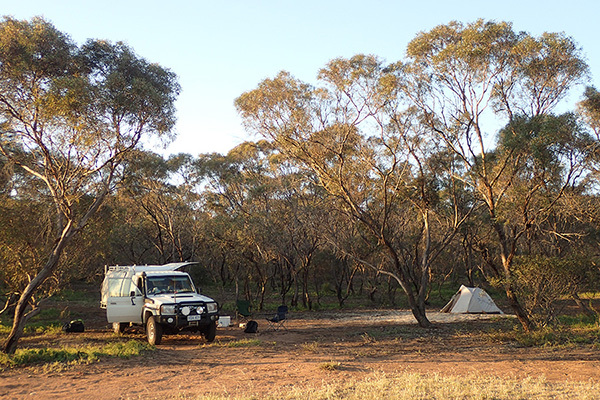 Camping at Wharminda Soaks, near Hincks Conservation Park. Photo: J. Kellermann. ¹ The links provided are to VicFlora genus factsheets, as there are no current South Australian or Australia-wide treatments. Contributed by botanist Jürgen Kellermann. This entry was posted in News on 20 November, 2018 by Jürgen. The State Herbarium of South Australia published one article in the online version of Vol. 30 of the journal Swainsona, today. This volume of the journal contains the Proceedings of the Botany Symposium“Botany 2016 — Past, present and future“, which was held at the 2016 NRM Science Conference. to celebrate the 60th anniversary of the State Herbarium. 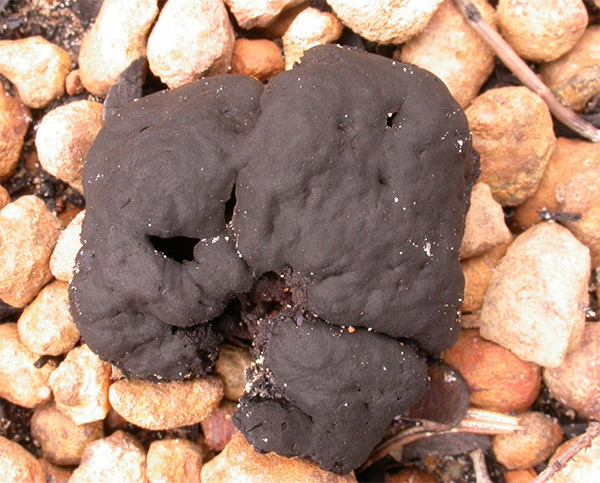 Inkyluea ballioides, a marine algae from S.A., Vic. and Tas. (also known as Ballia ballioides). Photo: B.Baldock. The authors review the history and current status of phycological research in South Australia. 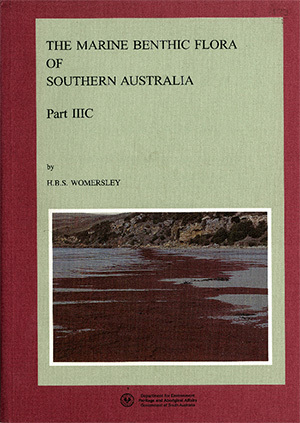 They point to the importance of Prof. Bryan Womersley‘s work, whose Marine benthic flora of southern Australia (1984-2003) documented the algal diversity of our coasts in exemplary detail and critically revised many groups of algae. They also discuss the impact of new molecular methods and the continuing importance of herbaria, as well as pointing out some current and future challenges. The scans are made available in collaboration with the Australian Biological Resources Study, Canberra. Fact-sheets on all south Australian algae, based on the book series, are also available through the eFloraSA system. This entry was posted in Publications on 7 November, 2018 by Jürgen. Today, the State Herbarium of South Australia published two article in the online version of Vol. 31 of the journal Swainsona. Antrelloides atroceracea. Photo: D.E.A. Catcheside. Hon. 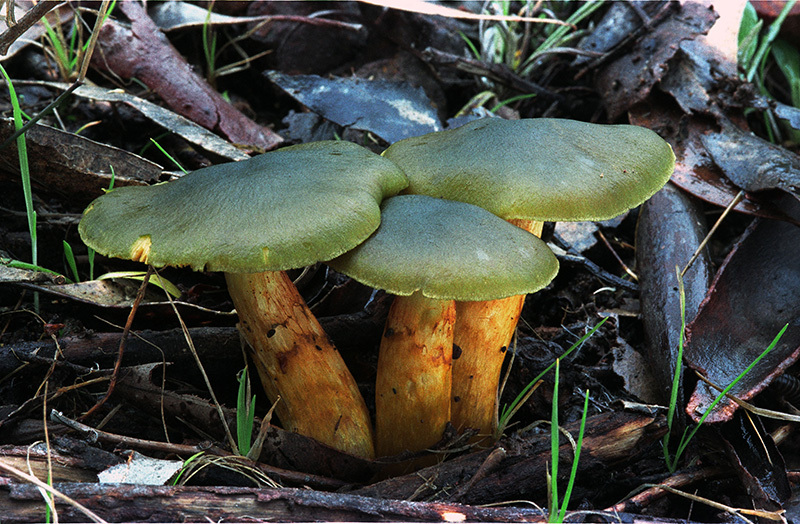 Research Associate Pam Catcheside publishes a new species of fungi that taxon occurs on Kangaroo Island and in Western Australia. Especially exciting is the fact that this species also belongs to a new genus. The authors examined the taxon with molecular methods and present its placement in a phylogeny of related genera of Pezizales. They also present detailed morphological observations on the new species. Because of its appearance, it is nick-named “Black Shoe Leather”. 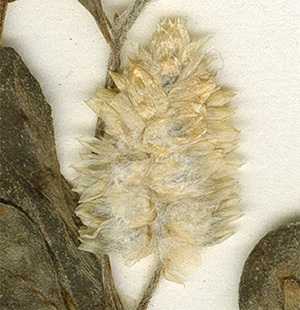 Ptilotus unguiculatus inflorescence from the type specimen (PERTH). Tim Hammer from The University of Western Australia describes a new species of Ptilotus (mulla mulla), which is only known from one collection from Eddaggee Station, in the Shark Bay area of Western Australia. He compares it with related species, including P. murrayi, which also occurs in the far north-east of South Australia. This entry was posted in Publications on 28 September, 2018 by Jürgen. Although primarily in the UK to visit family and friends, I was delighted to find that a symposium was being held on fungi on 13th and 14th September while we were in the London area. Moreover, it was to be at Kew where I had spent many happy days in my youth amongst its strange, beautiful and amazing plants. A previous Kew project in 2016 (updated in 2017) to report on the ‘State of the World’s Plants’ had been hugely successful and it had been decided that it was timely to consider the fungi. 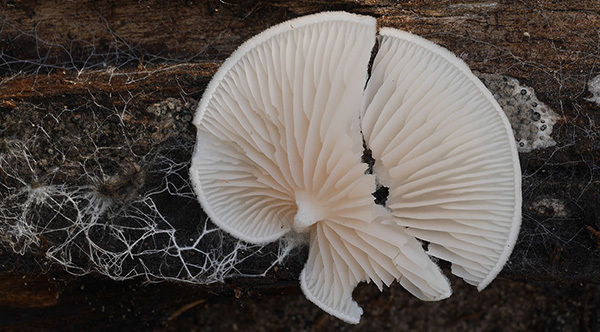 At the September meeting this year the report ‘State of the World’s Fungi’ was launched. It covers fungal diversity, the fungal tree of life, new discoveries, useful fungi, plant-fungal interactions, fungal genomes, fungal conservation, threats posed by fungal pathogens and climate change. Over 260 people attended the symposium, not only mycologists but botanists, plant breeders and plant pathologists, industrial chemists, those working in bioinformatics and systematics, conservationists, lichenologists, growers of fungi – anyone with a serious interest in fungi. The main aim was to review the current state of knowledge of all aspects of fungi. There were seven sessions: conservation of fungi; plant-fungi interdependence; importance of lichens; threats and benefits of fungi to ecosystems; fungal networking; commercial value of fungi; discussion of ‘dark taxa’, i.e. those with only a molecular signature. Sixty-seven posters complemented the talks. See the programme and Conference Booklet (31mb PDF) for details and full abstracts. 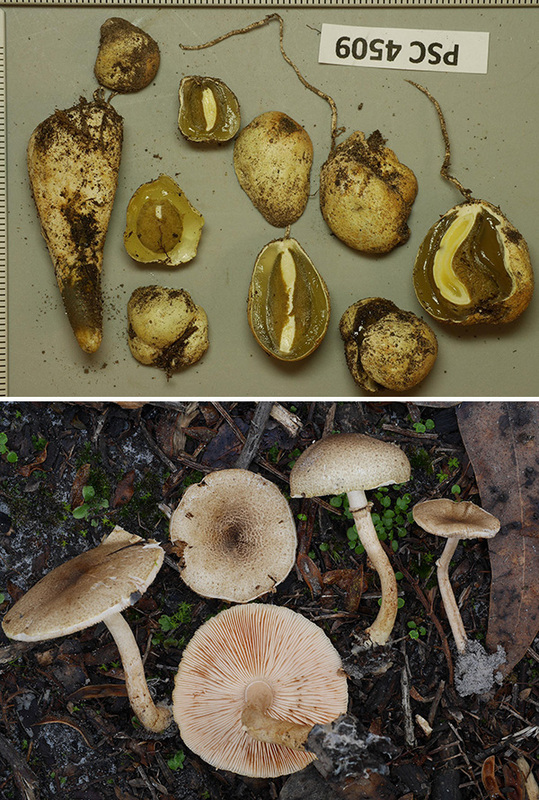 Two species of fungi collected during a field survey in Kangaroo Island. Photo: D. Catcheside. 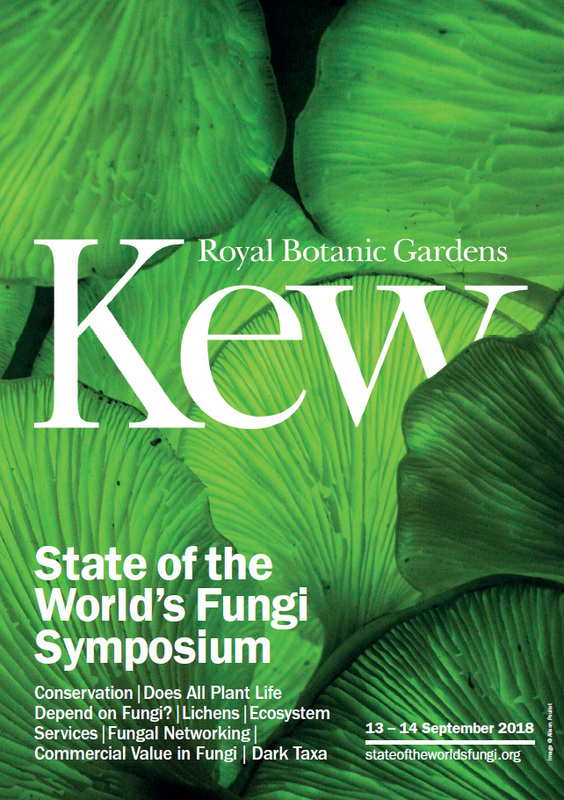 The whole conference ran like clockwork, starting with a rationale for the symposium and report and an overview of current knowledge of fungi and given by Professor Kathy Willis, Director of Science at the Royal Botanic Gardens, Kew. With an approximate number of 3 million species, knowledge of what fungal species there are is relatively scant, with only 144,000 or 5% named. With respect to conservation status, only 56 fungi are on the IUCN Red List, compared with 25,452 plants and 68,054 animals. The symposium was by no means doom and gloom though. The estimated 350 species of edible fungi are worth approximately US$42 billion each year. The medical benefits of fungi are inestimable from their use as antibiotics such as penicillin, cholesterol-reducing statins such as lovastatin produced from Aspergillus terreus and the immunosuppressant drug cyclosporine which has made organ transplant possible and is produced from Tolypocladium inflatum. Fungi are also being used to make biofuels, in washing detergents, cotton processing, bioremediation and of course yeasts which underpin the baking, wine and beer industries. I was intrigued to learn that fungi are being used to make leather shoes, easily biodegradable when the user is tired of them. I also had not realised that Lego is made using itaconic acid derived from a species of Aspergillus. Cortinarius austrovenetus, a species native to the Southern Lofty Region. Photo: D. Catcheside. Especially exciting is that whole genomes have been sequenced for more than 1500 species, more than the number sequenced for plant and animal species combined. Knowledge of the genes and metabolic pathways is helping the design of effective therapies against pathogenic fungi. Genome sequencing of mycorrhizal fungi is providing insights into how to manage ecosystems more effectively and to deal with problems facing humanity such as climate change. 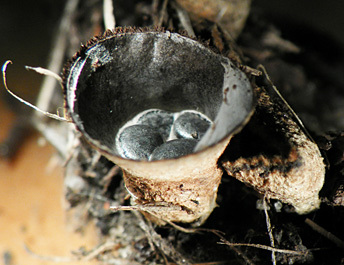 Cyanthus olla, the birds nest fungus. Photo: B. Baldock. If I had my fungal time over again I would work with fungal endophytes. These live within plant root, stem and leaf tissue and it is thought that they occur in all plants. Though some may be harmful, many confer advantages to their host such as resistance to stresses such as drought, heat, salinity and pests. Trials have been conducted with a seed treatment containing fungal endophytes with a view to improving crop production and mitigating the effects of climate change. The poster session was introduced by each of the 67 presenters explaining their poster in 45 seconds. The whole ‘performance’ was accomplished most impressively in one hour! A copy of the full ‘State of the World’s Fungi’ report can be downloaded from the website. You can also listen to an interview with Dr Tom May, senior mycologist at the National Herbarium of Victoria, discussing the report with Phillip Adams on ABC’s Late Night Live program. Contributed by Hon. Research Associate Pam Catcheside. This entry was posted in News on 24 September, 2018 by Jürgen.